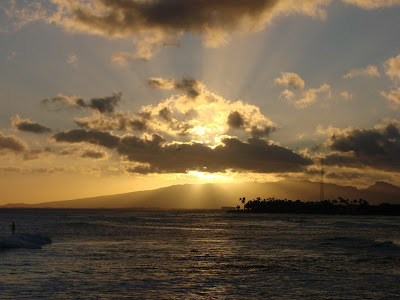 Sunset a Ala Moana Beach Park. I like how the clouds force the rays of light from the sun to project into the sky. Somehow no matter how often you see the sunset each one is always special in its own way and it a great way to unwind after a hard days work… or after a nice day at the beach. 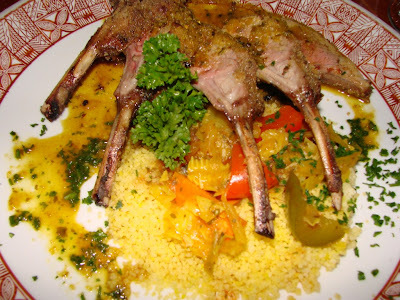 Here is the rack of lamb main course at Casablanca restaurant in Kailua. While the presentation looks a little messy the lamb as delicious. Of course it was also more of a challenge to eat the rice without utensils but its all part of the experience. Meals here are all prix fixe and come with the salad from yesterdays photo, soup (which on this day was a Harira soup), the tasty B’stilla (fillo dough with saffron chicken, almonds, eggs which is baked and topped with powered sugar and cinnamon) bonus photo below, the lamb main course (or your choice of several others) and a dessert of Chabbakia (deep fried funnel cake dipped in honey). 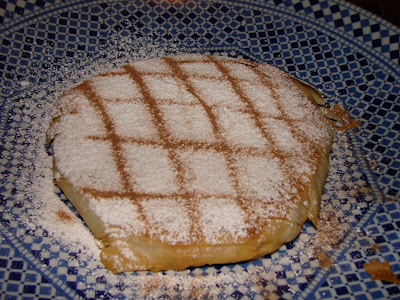 Located in Kailua on the island of Oahu is Casablanca a Moroccan Restaurant. 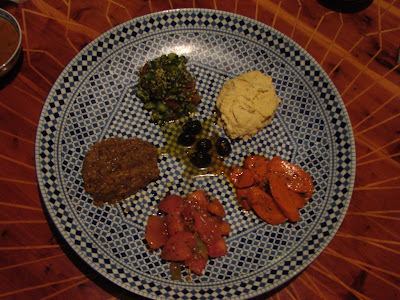 Here is their Moroccan salad consisting of roasted tomatoes & bell peppers, eggplant, carrots, hummus and tabbouleh. This was accompanied with a nice basket of bread that you could use to scoop of these items. We went all out and chose to dine in authentic style where you have no utensils and just scoop the salad onto your bread. If you are averse to this they will provide you utensils but then again I feel its best to experience authentic Moroccan food in the way it was meant to be enjoyed.